It has been a long time since I used the Flash software. The last time I learned it was probably in 2005. Going through this book is sort of a refresher course for me. I borrowed this from the library. 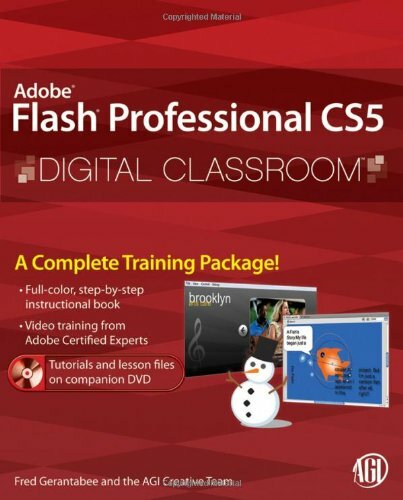 It's 464 pages and comes with a DVD containing the lesson files and video training on selected chapters. There are 15 chapters of tutorials. All instructions are step by step and easy to follow. The book covers the foundational stuff very clearly. I managed to finish the book within a week, going through about 2-3 chapters daily. Now I'm back up to speed on Flash. The book only covers enough ActionScript programming to give you an idea how to create basic functionality, like moving to different scenes. For more advanced ActionScript lessons, a dedicated book would be better. This is a good instructional book.